BsnTech Networks has just completed a website design for Roach Asphalt out of New Auburn, WI. Charles, the owner, contacted us less than a week ago to have a website made. He quickly provided the information that we needed to make the website and some examples of websites that he liked. We got to work on the website right after obtaining the information from Charles. Less than one week later, the site is fully done and was just published. Thank you to Charles for your business with supporting BsnTech Networks as your website design source. 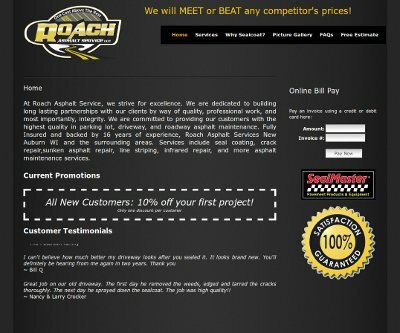 Roach Asphalt’s website is at roachasphalt.com.